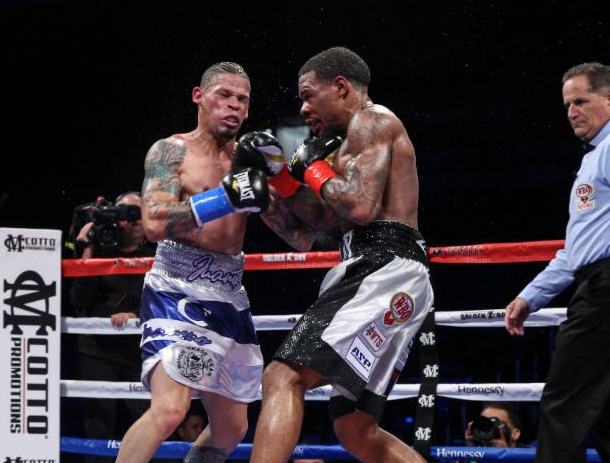 SAN JUAN, PUERTO RICO (April 19, 2018): Lamont Roach, Jr. (16-0-1, 6 KOs) and Orlando "El Fenomeno" Cruz (25-6-2, 13 KOs) battled to a hard-fought split draw over 10-rounds of 130-pound action in the main event of the April 19 edition of Golden Boy Boxing on ESPN at the Coliseo de Puerto Rico in San Juan. One judge scored the fight 97-93 for Roach, Jr., while a second judge scored the fight 96-94 for Cruz. A third judge scored the fight a 95-95 draw, meaning that the WBO International Junior Lightweight Title will remain vacant. "I think I should have won, but I showed that I was a true champ by going into his backyard," said Lamont Roach, Jr. "We didn't get the decision we wanted, but that's boxing. DC would be fine for a rematch, but whenever I get back in the ring with him I'm going to destroy him. The shot I landed in the ninth round should have been a knockdown, but sometimes you get the short end of the stick in the sport of boxing." "I thought the fight was going to be ruled a split decision in my favor," said Orlando Cruz. "Roach is a young, talented fighter, but I made him miss a lot. Either way, I must continue working and training. I definitely want the rematch." In the co-main event, Jose "Wonder Boy" Lopez (19-3-1, 13 KOs) of Carolina, Puerto Rico defeated Miguel Angel "Miguelito" Gonzalez (22-4, 19 KOs) of Los Mochis, Mexico across 10 rounds of lightweight action. Lopez won with scores of 97-93, 98-91 and 99-91. Magdiel Cotto (9-0, 7 KOs) of Comerio, Puerto Rico scored a tough majority decision win against Elie Agustama (6-8, 3 KOs) of Miami, Florida in a six-round middleweight fight. Cotto won with two scores of 58-57, while one judge had it a 57-57 draw. Danielito Zorrilla (6-0, 5 KOs) of Toa Baja, Puerto Rico defeated Jimmy Rosario (3-6, 2 KOs) of Vega Baja, Puerto Rico via third-round technical knockout in a super lightweight fight initially scheduled for six rounds. Carlos Caraballo (7-0, 7 KOs) of Guayanilla, Puerto Rico scored an impressive knockout victory after a ruthless liver shot dropped Antonio Rodriguez (10-22-1, 4 KOs) of Durango, Mexico at 2:12 of the fourth round of a scheduled six-round super bantamweight fight. Bryan Chevalier (9-1-1, 8 KOs) of Bayamon, Puerto Rico defeated Luis Diaz (3-5, 2 KOs) of Coamo, Puerto Rico via unanimous decision over six-rounds of lightweight action. Chevalier raised his hand in victory with three scores of scores of 60-52. Juan "Merengue" Abreu (21-3-1, 19 KOs) of La Romana, Dominican Republic scored a 10-round unanimous decision win against Luis Hernandez (16-6, 9 KOs) of Rio Piedras, Puerto Rico in a middleweight clash. Abreu scored a knockdown in the ninth round before winning with scores of 98-91, 99-90, and 97-92. Jean Rivera (1-0) of San Juan, Puerto Rico opened the night of action with a unanimous decision victory against Jonathan Delgado (0-1) of Mayaguez, Puerto Rico in a four-round welterweight fight. Rivera won with three scores of 40-36. Roach, Jr. vs. Cruz was a ten-round fight for the vacant WBO International Junior Lightweight Title presented by Golden Boy Promotions and Miguel Cotto Promotions. The event was sponsored by Tecate, "THE OFFICIAL BEER OF BOXING," and Hennessy "Never Stop, Never Settle." The fights took place on Thursday, April 19, 2018 at the Coliseo de Puerto Rico in San Juan. Videos and images are available for download by clicking here or copying and pasting the link: http://bit.ly/RoachJrCruz must be given to Golden Boy Promotions.